Press Conference announcing the Winners of the City of Middletown's Race 4 Space Competition. Oak & Reed, Farmer & Baker and Painted Horse Chocolates will be located in the re-purposed Woolworth's building on North Street. This project is one of the City's DRI Projects. Photos from the City of Middletown Festival of Lights Celebration at the Run 4 Downtown Park! Rabbi Rubenstein of Temple Sinai, along with Mayor DeStefano light the Menorah. Special Thanks to all the students who performed from Monhagen Middle, Maple Hill Elementary & William A. Carter Elementary schools! 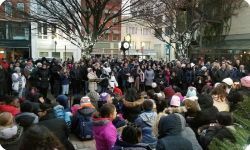 Photos from the November 23rd 2018 Annual Tree Lighting Ceremony & Parade. 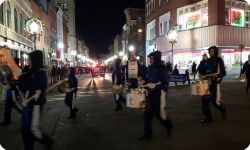 Despite the cold it was an amazing night in downtown Middletown! 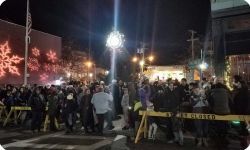 On Saturday, November 17, 2018 the Middletown Christmas Tree was decorated with approximately 2,700 LED lights. 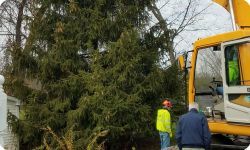 Friday, November 2nd 2018, marked the arrival of the City of Middletown Christmas Tree. The tree has been donated by The Foglia Family. The Tree was cut by Aspen Landscaping and Tree Services. The Middletown Police Department & The Town of Wallkill Police Department escorted Reginal Trucking as they transported the tree to Festival Square. The Department of Public Works assisted in the cutting and installation of the tree at Festival Square. Harry Rotolo & Sons, Inc., members of The International Brotherhood of Electrical Workers(IBE Local 363) will decorate the Tree with lights on Saturday, November 17th, 2018. Don't forget to join us on Friday, November 23rd at Festival Square for The 2018 Annual Tree Lighting Parade and Ceremony. Festivites start at 6 PM downtown and Parade step off takes place at 630 PM! Followed by a free showing of It's a Wonderful Life taking place at The Paramount Theatre at 745 PM. Saturday, August 18, 2018. Thanks to the R4DT Organization and all the volunteers! Can't wait for next year! 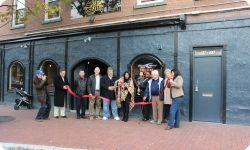 Friday, August 17th was the official ribbon cutting for QB Ball at 14 Cottage Street. QB Ball is a fowling facility, which is a combination of football and bowling. Check them out at qb-ball.com. Wednesday, November 8th 2017, marked the arrival of the City of Middletown Christmas Tree. The tree has been donated by Lance Weeden, and was cut from his home in the Municipality of Wawayanda. The tree is estimated to be around 25-30 feet tall. John Tresch of JHM Tree Service cut the tree this morning around 8:30 AM and it was erected at Festival Square around 10 AM. The Middletown Police Department escorted Reginal Trucking as they transported the tree from Robinn Drive in the Municipality of Wawayanda to Festival Square. The Department of Public Works assisted in the cutting and installation of the tree at Festival Square. Harry Rotolo & Sons, Inc., members of The International Brotherhood of Electrical Workers(IBE Local 363) will decorate the Tree with lights on Saturday, November 18th, 2017. Don't forget to join us on Friday, November 24th at Festival Square for The 2017 Annual Tree Lighting Parade and Ceremony. Festivites start at 6 PM downtown and Parade step off takes place at 630 PM! Followed by a free showing of It's a Wonderful Life taking place at The Paramount Theatre at 745 PM. 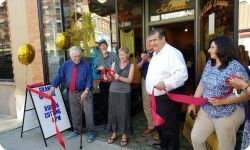 Photos from the Grand Opening and Ribbon Cutting of The Paleteria & Coffee Shop at 42 West Main Street. Taken on September 29th, 2017. 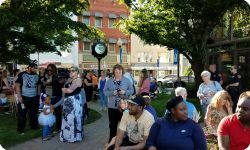 Ribbon cutting and official opening of the Skate Park in Downtown Middletown. Mayor DeStefano was joined by Common Council President Miguel Rodrigues and members of the Common Council. Thanks to all who helped bring this Park to life! Located at James Street & Union Street. 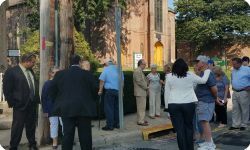 Photos from the 2017 Street Dedication Ceremony in Honor of Congressman Benjamin A. Gilman. Photos From The 2017 Stars and Stripes Celebration. Taken at Fancher Davidge Park on July 1st 2017. 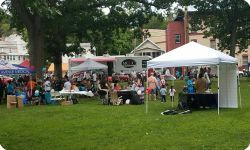 Taking June 24th 2017 at Thrall Park in Downtown Middletown. 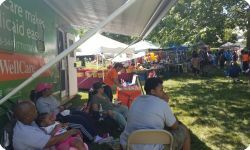 Featuring Live Entertainment,Cultural food, Crafts, Vendors, and Children's Activities. Installation of the Skate Park Molds in the future Erie Way Park! Lieutenant Governor Kathy Hochul visited the Paramount Theatre to announce which projects will receive funding through the Downtown Revitalization Initiative! 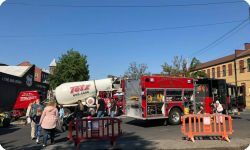 In attendance were Mayor Destefano, Common Council President Miguel Rodrigues, and several other departments heads from the City of Middletown. Senator John J. Bonacic and Orange Co. Executive Steve Neuhaus were also in attendence to say a few words. 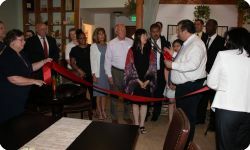 Pisco Sour Peruvian Restaurant Bar & Grill Ribbon Cutting took place January 6th 2017. Located at 14 North Street. 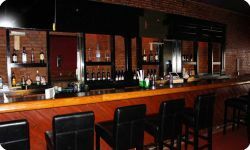 Pisco Sour is a Peruvian restaurant with roasted chicken, seafood, soups, lomos great cooking and price as well as great service. Welcome to the neighborhood! 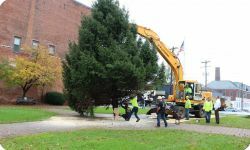 Wednesday, November 16, 2016 marked the arrival of the Downtown Middletown Christmas Tree. The tree was donated by Jillian Ye, and was cut on Ashley Ave. on the Middletown Community Campus. 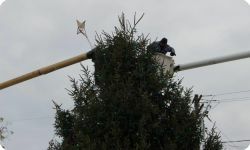 John Tresch of JHM Tree Service, cut the tree around 8:30 a.m. and it was erected in Festival Square at approximately 10:45 a.m. The Middletown Police Department escorted Regional Trucking as they transport the tree from Ashley Ave. to Festival Square. Mark Pengal and a crew of City Department of Public Works employees supervised. The International Brotherhood of Electrical Workers will decorate the Tree with lights on Sunday, November 20, 2016. Don’t forget to join us on Friday, November 25th at Festival Square for our Annual Tree Lighting and Parade. Festivities begin at 6 PM, and Parade step off taking place at 6:30! Followed by a Free showing of It’s A Wonderful Life taking place at The Paramount Theatre. Plus don’t forget that Silver Bell Saturday is taking place Saturday, November 26th. Shop local this holiday season! Photos from the August 4th 2016 Run4Downtown Press Conference. 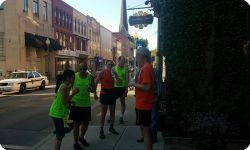 The Run4Downtown is taking place August 20th. Photos from the Da Tang Supermarket Grand Opening and Ribbon Cutting! Taken on May 27th 2016 at 10 East Main Street. With a weekend fresh fish counter and a sushi bar, its definitly a must see in our neighborhood. The New Town Clock has come to North Street! The clock was installed by Rotolo & Son Company outside of Something Sweet Cafe. The funds were donated by The Run 4 Downtown Proceed. Many thanks to the Run 4 Downtown Commitee for donating the funds. 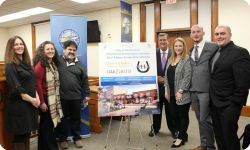 At a press conference on March 17th, it was announced that The Middletown Community Health Center is going to be moving to the Horton Complex! Super exciting news. Seen Speaking: Mayor Joseph M DeStefano, Theresa Butler, CEO of Middletown Community Health Center, Dr. Joseph Lanza, Tony Danza, and Dr. Jerry Cammarata. Mayor Joseph DeStefano and Council President Miguel Rodrigues will be announcing Michelson Studio II, a significant economic development project for the City of Middletown. Michelson Studio II is a New York State qualified production facility and is nearing completion. Once completed, Michelson Studio II will be one of the largest sound and movie stage studio's in the Hudson Valley and New York State. Michelson Studio II is a 60,000 square foot former railroad car repair facility which boasts, among other things, 60 foot ceilings and state-of-the-art design and lighting. 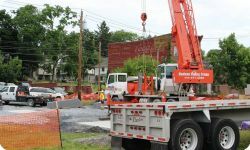 Michelson Studio II is expected to place Middletown at the center of filmmaking in the Northeast while also producing jobs and infusing dollars into the community. Check out our photos from our 2015 tree arrival! Starting at the Levi Residents all the way to Festival Square! Remember this years tree lighting is taking place Friday, November 27th, with festivities starting at 6 PM. Regional Trucking, for the transportation and machinery used for cutting the tree. John Tresch of J H M Tree Services, for cutting and trimming our tree. The City of Middletown DPW & Recreations and Park Department, for the machinery and man power. And the combined efforts in the spirit of Municipal Cooperation of the Town of Wallkill and The City of Middletown Police Departments in blocking off traffic and escorting our lovely tree to festival square. Pictures taken August 21st, at Festival Square, in Middletown, NY. Pictures taken August 20th 2015, at the park adjacent to Something Sweet, in Middletown NY. Pictures from August 15th, 2015 at the 10th annual Orange Regional Medical Center's Run 4 Downtown. Pictures also include trophies being handed out, and The Taste of The Town. It was a great day! Congradulations to all the participants. Pictures taken August 14th, at the park adjacent to Something Sweet, in Middletown, NY. Taken August 13th, at the park adjacent to Something Sweet, in Middletown, NY. Taken July 31st 2015 at Festival Square, Middletown NY. Taken July 24th, at Festival Square, in Middletown, NY. Taken July 23rd, at the park adjacent to Something Sweet, in Middletown, NY. Taken July 2nd 2015, at the park adjacent to Something Sweet, in Middletown, NY. Taken June 19th 2015, at Festival Square, in Middletown, NY. 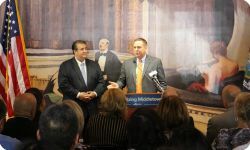 Pictures From The June 4th, 2015 Press Conference about the move of the Middletown City Court from James Street, by purchasing the vacant Federal Court House located on South Street. Click here to check out Pictures from the Press Conference Held on November 21st. The YMCA of Middletown held a press conference to Thank Rich and Maryanne Rowley & D.W. and Christine Porto for their contribution to the Save the Last Lap Fund. With just over 180 days left in the Save The Last Lap Campaign, there is still time to donate today! Visit their website Savethelastlap.org for more information about the Y, the stories of individuals whose lives have been changed by the current pool, facts and figures, and how to make your own donation! The BID is happy to welcome Diana's Treasures, Antiques & Collectibles, located at 5 East Main Street! Pictures are from opening day, October 3rd, 2014. We wish the family much success! 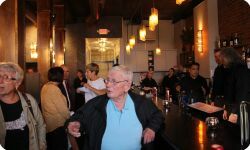 On September 26th, 2014, the City honored Vincent Dino outside of the former site of Dino's Lounge. Dino was known for attracting national acts during the Rock & Roll Era, such as Chubby Checker, Little Anthony & the Imperials, the Dupree's, the Coasters and a host of other local bands. Dino's influence spanned beyond local night life to many youngsters who grew up playing organized sports. A plaque recognized the Middletown all-star and was unveiled in his honor. The Middletown BID is pleased to Welcome Wild Soul Yoga Studio to the downtown area. 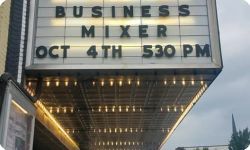 Pictures are from the Grand Opening and Ribbon Cutting on September 12th, 2014. 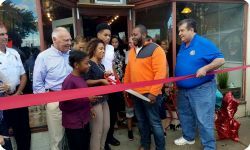 The Middletown BID is pleased to Welcome Kindred to the downtown area. 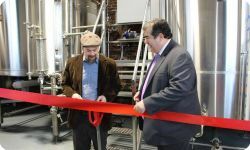 Pictures are from the Grand Opening and Ribbon Cutting on September 12th, 2014. Photos from the Honorary Street Dedication for Aaron Tveit outside of the Paramount Theatre on August 31st 2014. 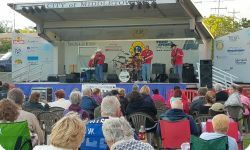 Pictures From our 2014 Summer Concert Series. Taken at Festival Square & The Park Adjacent to Something Sweet. 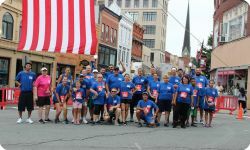 Here are pictures from today’s Ninth Annual Orange Regional Medical Center Run 4 Downtown. Thank you to all who were involved, either as a sponsor or as a participant. We had a great crowd today, and we took a lot of pictures. Feel free to browse through. We would like to specially thank Something Sweet Dessert Cafe, Mid-City Transit, The YMCA of Middletown, Shoprite of Middletown, Poor Bobby’s Hard Times Tavern, WellCare, and Warwick Valley Winery & Distillery. For full result list visit run4downtown.org. Remember, all proceeds go to revitalization of our Downtown area! August 5th marked another successful Night Out Against Crime, Sponsored by The Neighborhood Watch! Thanks to all who came out in support! Feel free to browse the photos and tag your friends and family. 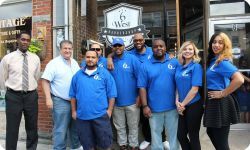 A Press Conference was held at Something Sweet July 31st about the Run 4 Downtown taking place August 16th at 9 AM. Registration is still going on so feel free to visit run4downtown.org to learn more today. Feel free to browse through and check out the updates made to former Horton Hospital. 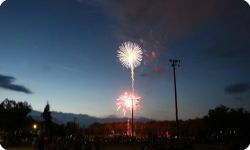 Enjoy browsing our photos from this years Stars and Stripes Celebration. Thank you to everyone who helped make this a wonderful and eventful day for the entire community! 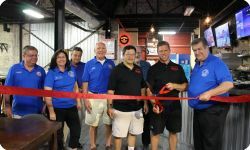 Check it out, Pictures from the Grand Opening of The Sugar Shack. Located on King Street! 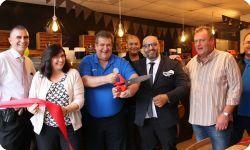 Pictures from all of our Local Businesses. Feel free to browse through and enjoy. 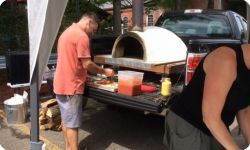 Pictures from our Farmer's Market. Running from June to October on Saturday Mornings at Cottage Street and Railroad Ave.
Pictures from our Annual Tree Lighting Ceremony! Taking place at Festival Square.